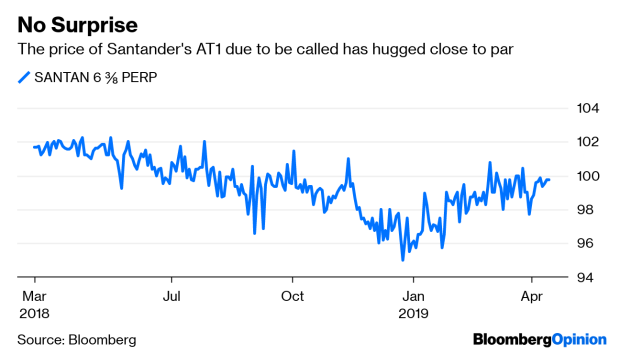 (Bloomberg Opinion) -- On the face of it, Banco Santander SA might look as if it’s pandering to investors with the decision to redeem a $1.5 billion issue of its riskiest debt on the expected date. But it’s not. This is just the cold, hard financial logic that Spain’s biggest lender always adopts when dealing with the bond markets. About the only sop from Santander to its debt-holders is that this redemption notice comes a few days before it had to, no doubt because of the upcoming Easter holidays. But don't confuse this early call for a dollar CoCo as any change of the bank’s practice of doing anything it can to cut its financing costs. It treats every bond individually and conventions are for the birds. Caveat emptor.